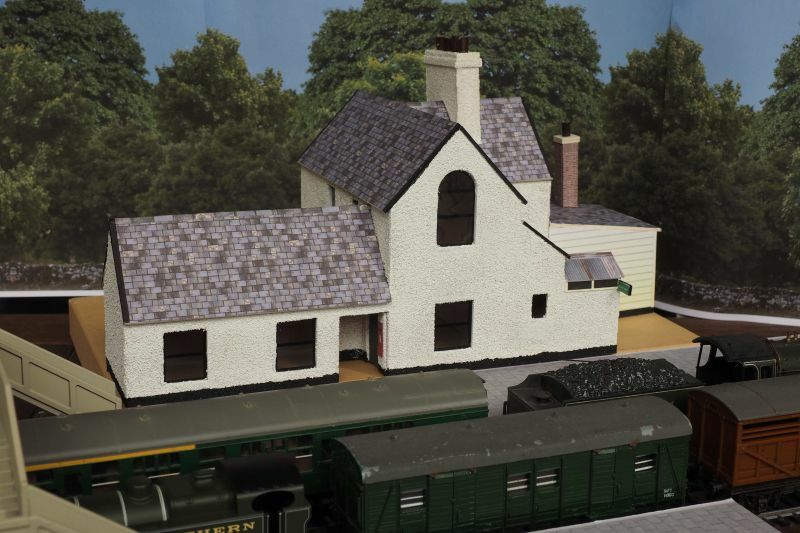 I wanted to base my model railway around Bridestowe Station in Devon, Having lived in the area for a number of years and at one point almost purchasing the station myself. Rather an unusual design but seems to have been popular in the area, a number of stations on that part of the line are similarly constructed. 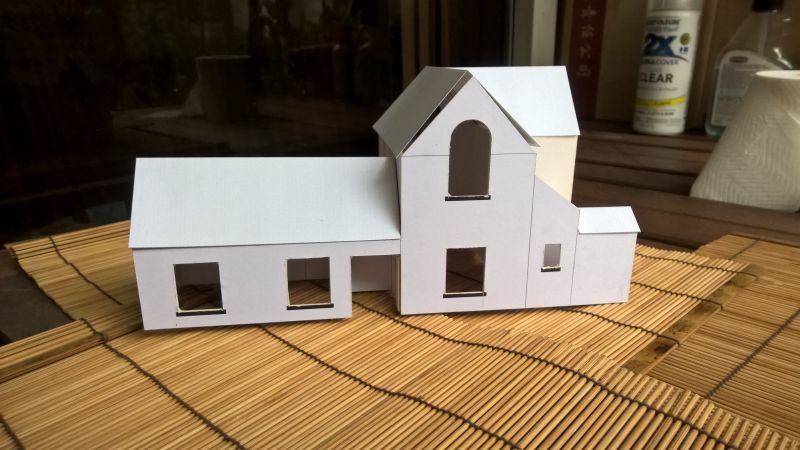 I used 2mm artists board for the main construction with windows laser printed on acetate. Initially I scaled the building from what few photographs I could find and then drew the panels at scale size in a CAD program. These were then printed reversed onto A4 labels and stuck on to the Artists board ready to cut out. Cutting out was done with a sharp knife and the parts glued together with a small hot glue gun. The roofs were just paper to complete the image at this stage. The original building is rendered with cement and then had "Snowcem" paint applied. To get that effect the building exterior was sprayed with photo adhesive and coated with silver sand before spraying with white acrylic paint. 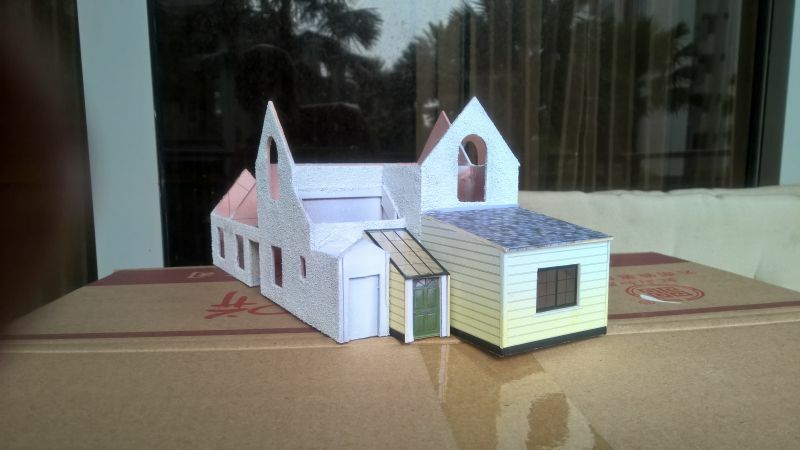 Finally printed slate roofing was applied over 2mm artists board and it was placed in a diaorama. 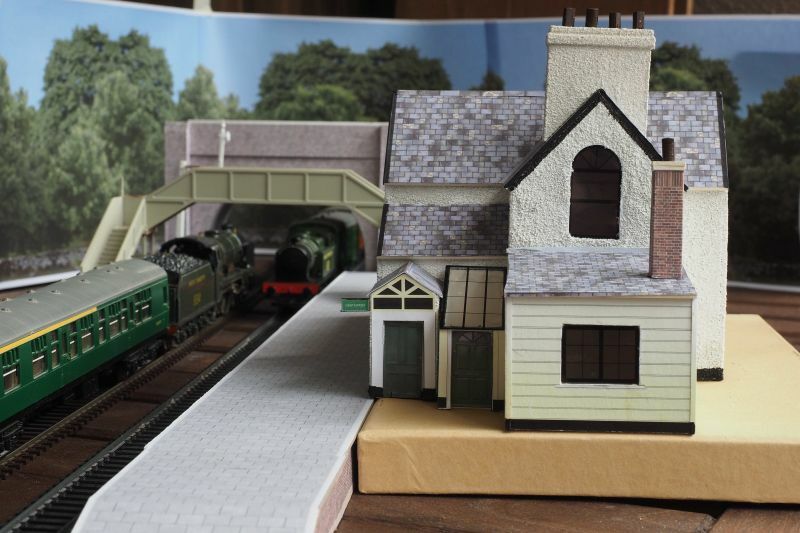 The footbridge is a ratio kit which is exactly as the one on the station platform. SR used a lot of concrete construction methods in their region. 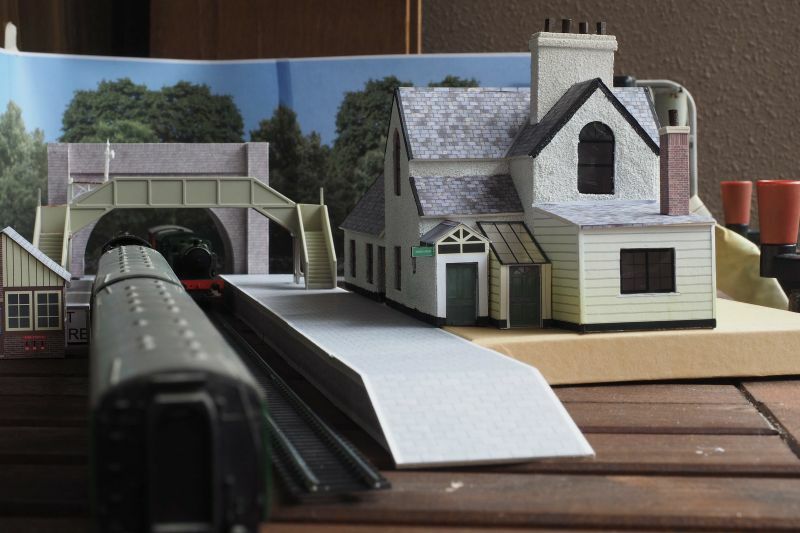 The road bridge is a printed kit from Woodlands modified for this layout. There are a number of photos of the station on the internet. It is currently a private house and the waiting room roofline has been raised to make it two story but otherwise it remains unchanged. Certainly a different style of building construction - well done. 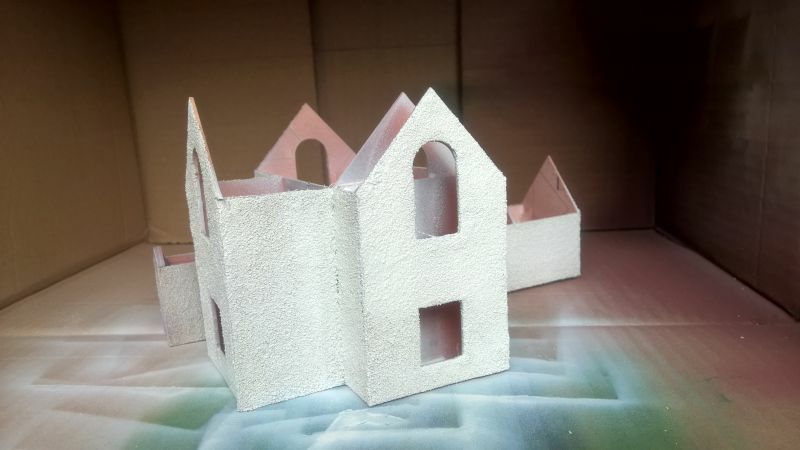 Nice scratchbuild there certainly looks really good the 2mm artist board is a good material to use. Thank you for the comments gentlemen, this was my first attempt at scratch building. A very good first go at it, Bill. It's the ideal subject for you to practice your weathering. I'd work with pastels for a start. You can always brush them off and change them for fun. Nice work and I presume it's in 00 gauge? 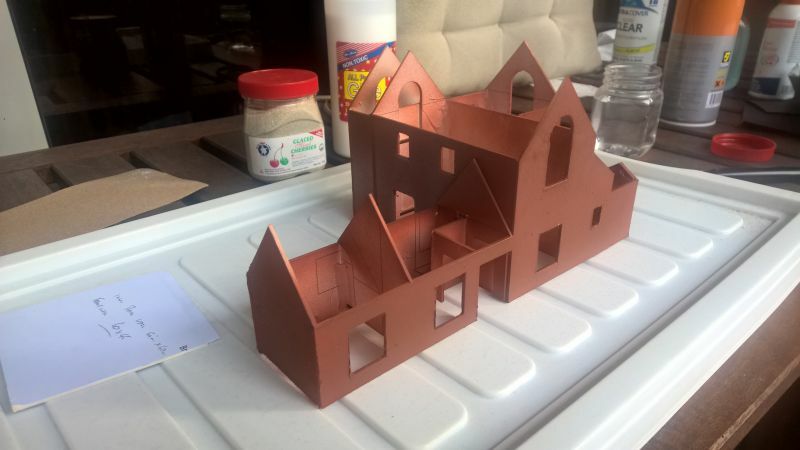 I also scratchbuild all my stuff but in N gauge which is real fun! I know this station very well as I only live 8 miles away in Okehampton (and I cycle past there frequently in Summer along the old railway line cycle path called the Granite Way). As a matter of interest they want to open this Line again but whether it will ever happen is open to conjecture. A good friend of mine lives in that house. Sustrans wanted right of way along the track bed which is now his front garden. I lived in Bridestowe village for 10 years, The last bungalow on the right as you drive up the hill to Bridestowe Station. Previously called Belle Vue when I lived there. My ex sold it recently (around 2015 I think) after splitting the garden in two. That turned out looking very nice! And you say you almost bought the actual station yourself? Is there a story to that? Nice build. Rendering looks very realistic.